ID cards are for identity of a person in an organization including information of card holder person. Software makes it easy to design, modify, and print customized ID cards for employees IDs, student IDs, visitor registration as well as Gate Pass for the visitors. ID Cards Maker (Corporate Edition) Software design and print multiple id cards with different text and barcode value using Batch Processing Series option. Software is also having 'Visitor ID or Gate Pass Mode' for quick designing of Visitors ID card and Gate Pass for the visitors. 'Live Group and Batch Processing Mode' of the software is designed for ID card Designing of group of people by browsing the details from Excel File. You can also Email your designed ID Card at specified email id using 'E-mail setting' feature of this software. 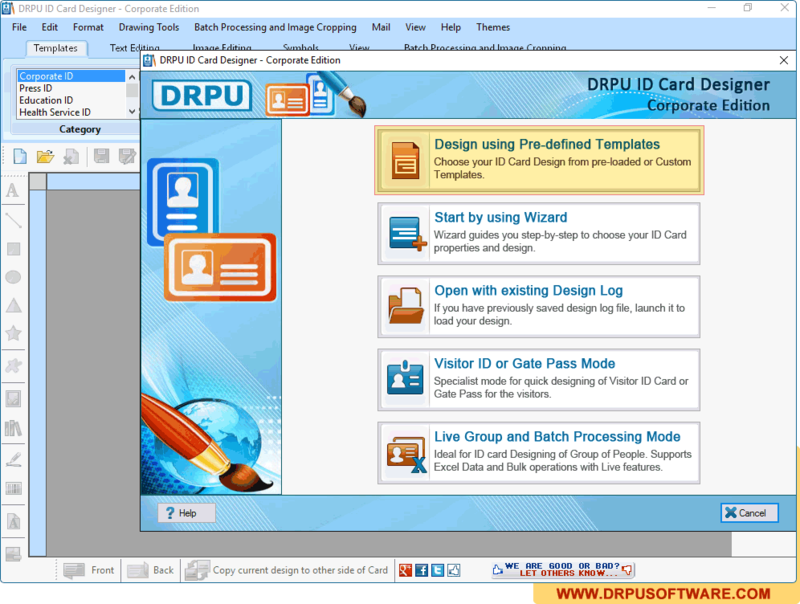 As you can see in above screenshot, Software provides 5 modules for designing ID card. You can choose any module as per your requirements. For demonstration purpose, Here we have choosen "Design using Pre-defined Templates" module. Provides facility to browse data from excel sheet while designing ID card. Generate multiple ID cards with different barcode and text value. Print designed ID cards using advanced print setting option with support to all major types of printers. To copy current design of ID card to the other side of Card. You can Export as Image (JPEG, PNG etc. ), as PDF and as Template.